The space around you informs your life, your emotions, and your overall happiness. In this 3-part series, we will invite you to explore how to powerfully create your very own Sacred Space and Personal Altar, which encourages a sweet space for reflection and connection, and set your intention for 2018. April 18 (Part 1): What is Sacred Space? 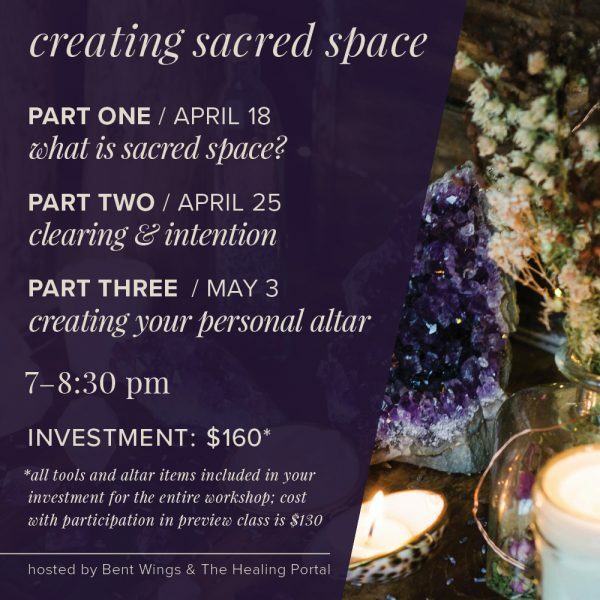 – In Part 1 we will explore what Sacred Space is and how to identify your own personal space and to connect to your highest guidance. April 25 (Part 2): Clearing and Intention – This workshop we will give you tools on how to clear space and create your intentions! Erin and Kelle have will guide you through selecting, clearing, intending, and the ceremony of creating YOUR sacred space. *=All tools and altar items are included in your investment of $160 for the entire workshop.